Pit Boss Austin XL 1000 Review - Construction, Performance, Warranty etc. After a long working week, the first thing which comes to your mind is to finally transition into relaxation mode and enjoy your weekend. For me, the best way to spend a sunny weekend is with my friends and family over a classic backyard barbecue party. There is no other similar joy than spending quality times with your loved ones while waiting for your meat to finish grilling. After a few years of experience on outdoor cooking, I can surely say that Pit Boss is one of the major outdoor cooking devices manufactures out there. After previously having a couple of their devices, I decided to give a try to the Pit Boss Austin XL 1000. I decided to put together an article with everything you need to know, including some Pit Boss Austin XL reviews, advantages and disadvantages, my personal opinion and frequently asked questions. Note: You can use the quick navigation table below to quickly jump through the article and read the section which you are looking for. If you want to jump directly to the conclusion, click here. 1 Pit Boss Customer Reviews - Is it Legit? 2 Benefits of Buying a Pellet Grill? 10.1 How many burgers can you cook at the same time? 10.2 What temperature range can Austin XL cook? 10.3 Is Austin XL good grill for beginners? 10.4 Which is the best temperature to cook on this model? 10.5 Can I bake food on Pit Boss Austin XL 1000? Pit Boss Customer Reviews - Is it Legit? Pit Boss Grills is a part of Dansons INC, which was founded by Dan Thiessen and his two sons, Jeff, and Jordan in 1999. They are a very popular brand across the bbq community, better known for their durability, craftsmanship and their family-style of doing business. Their two founding principles which the brand is built upon are: ‘Bigger, Hotter, Heaver & at a Better Value than the competition’ & ‘Constantly improving’. Pit Boss grills offer a huge variety of products, from portable models like the Pit Boss Tailgater to massive size models, such as Austin XL 1000. 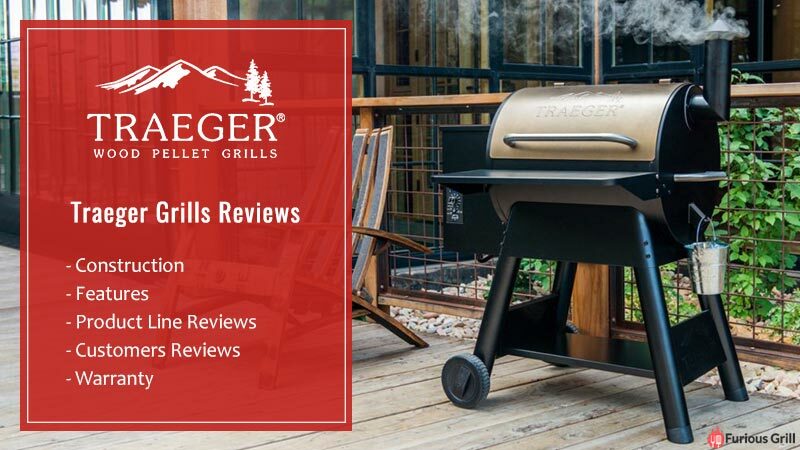 Today, they claim to bring the best value per square inch in the grill market and are focused a lot on improving their pellet grills, which is kind-of an exploding market at the moment. One last worth mentioning feature is the ‘EY Entrepreneur of the Year (2017)’ award given to the founders of Pit Boss Grills, which shows credibility and hard work of the founders towards their brand. Benefits of Buying a Pellet Grill? As I mentioned in the upper paragraph, pellet grills are a hot trend right now and one of the fastest growing segments within the market. But, what are the advantages of these kinds of grills over the traditional ones, that are making the customers switch from the traditional charcoal or even gas? One of the main advantages of pellet grills is the ease of use. These type of grills are packed with features which will make your grilling experience much enjoyable and easier than the other traditional grill models. Push-of-a-button ignition, clean start up without using liquids, fast preheating process, automatic pellet controlling system, etc. are some of the features which will save your time and will help you cook better and faster. Thanks to being developed in the 20th century, the pellet grills have benefited from the boom of the technology developments and the manufacturers have taken advantage to improve their products. Pellet grills have precise temperature control, which makes grilling experience very easy for anyone. Most models, all you have to do is adjust the temperature using the controls and the automated pellet controller will release pellets into the fire each time it needs to increase the temperature. This system automates everything from maintaining to adjusting the cooking temperature because you don’t have to worry anymore if the fire is hotter or if you should add any more pellets or not. The usage of gas grills brought a lot of advantages to the market such as the speed, versatility, temperature control but they don’t have the ability to give your food the unique wood flavor. Pellet grills offer you most of the gas grills advantages and on top of that, they have the ability to give your food the unique and delicious wood flavor, which most people admire. Pit Boss offers a huge variety of pellet smokers and the Austin XL model is kind-of their traditional classic model, with fewer technological developments when compared to their other models. Of course that the shortage of technology involvement has also made this model more affordable than its siblings in the same size and category. The Pit Boss Austin XL offers superior cooking at an affordable cost. It has been designed ideally for a large group of peoples or small backyard parties. In the outside, it has a durable construction and a copper finish, which will protect the unit from different weather conditions and other elements. As the name suggests, it has a large cooking space, is capable of reaching temperatures of up to 500°F and has an automatic start and shut down control system, which is pretty standard for pellet smokers of this kind. With all its cooking space and power, this model will easily cook food for a large group of people at the same time, without you having to wait until one round of food is finished cooking. When it comes to grilling and smoking food, the cooking space is always important. The Austin XL features two tiers of porcelain coated cooking grids, offering about 1000 square inches of cooking area, from which 930 sq. in. are directly cooking space. As for hopper capacity, this model is capable of managing 31 lbs of wood pellets at the same time, which is pretty good as it helps you save some space by not holding pellet bags around and also allows you to cook foods such as chuck roast or turkeys which require a long period of time to be cooked. So, you don't need to worry about pellets running out. As for performance, this model is fueled by 100% all natural hardwood pellets and operates with true fan-forced convection cooking, which is capable of reaching up to 500°F of cooking temperature. It offers you about 20,700 BTUs, which is more than enough to cook up to 52 burgers at the same time on its massive cooking space. 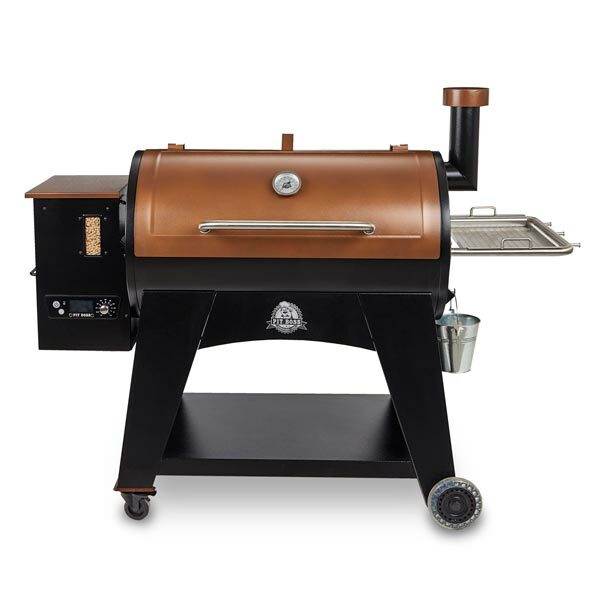 When you first look at this model, you will quickly notice the traditional black design finish found in almost every pellet smoker, and a couple of brownish pieces such as the lid, chimney, hood, etc. The brownish color is a high-temperature copper finish, which Pit Boss decided to apply on the embossed lid, chimney, side shelf hood and a few other parts of the grill. As for mobility, even though this unit weighs about 179 lbs, you can easily move it around, thanks to its four wheels found on each leg. Other worth mentioning features in the construction section are the stainless steel side shelves, the hood handle for easy opening and closing the hood when it is hot and the built-in thermometer on top of the lid. Ease of use is one of the main advantages of pellet smokers and Pit Boss Austin XL doesn’t make an exception. Thanks to its full function LED control unit, anyone can control and use this smoker. You can easily adjust the temperature from 150 to 500 degrees Fahrenheit, according to your needs and preferences, and the unit will add pellets to reach the desired temperature. There is also a meat probe to quickly monitor the cooking temperature and a digital display to see the previously programmed temp. When it comes to versatility, this model offers you 8-in-1 functions. It doesn’t matter if you want to bake, roast, grill or smoke, this model will serve you well with its precise temperature control and its wood-fired flavor. The standard flame broiler allows you to cook either on direct or indirect grilling method and for those of you who like to give a nice sear finish to your food, you can just slide the plate over the open flame section. Although there are not any major drawback to this model, one thing that we can consider a disadvantage is that this model is not as popular as the other models on the market. This may not be a real drawback for many as long as it is a decent and great unit but if you need help for something, you will have a hard time finding another customer with the same issue as you. Also, based on a few customer reviews, this model can have durability issues over the years, even though we think that the heavy duty stainless steel construction and copper finish are capable of protecting your unit pretty well unless you don’t do any maintaining at all. As our verdict, we think that the Pit Boss Austin XL is a pretty decent pellet smoker grill. It has a great combination of power, cooking space and durable construction, with a few touches of technology developments, to make the grilling experience even more enjoyable. Even though some may not like that this isn’t the most popular Pit Boss model out there, still, if you are more of a traditional grilling/cooking experience, then this model has everything that you may be looking for. How many burgers can you cook at the same time? Pit Boss Austin XL has a 1000 square inches cooking space and is capable of cooking up to 52 burgers at the same time. What temperature range can Austin XL cook? Austin XL 1000 is capable of cooking food from 150°F up to 500°F. Is Austin XL good grill for beginners? I think that this model is not the best option for a beginner even though it has precise temperature control. The lack of technology involvement will require you to do more manual adjusting and will require more experience to cook out a perfect meal. Which is the best temperature to cook on this model? I think that there is not a perfect temperature to cook on a pellet grill. Everything depends on the food and recipe you are trying to cook. Can I bake food on Pit Boss Austin XL 1000? Yes, Pit Boss Austin XL 1000 offers you an 8-in-1 versatility; Sear, BBQ, Roast, Grill, Braise, Smoke, Char-Grill and Bake. Thanks to its precise temperature control and settings unit, you can easily use it for one of the upper mentioned cooking methods.